Despite the fact that summer is in full swing, playing “school” never goes out of season for some tots. Child’s Cup Full‘s interactive calendar is the perfect enriching activity station for teacher wannabes: the handmade calendars help kids learn days, months, seasons, and weather. Each calendar is hand embroidered in the West Bank by women from refugee and low-income communities, and takes more than 26 hours to complete. Child’s Cup Full, a non-profit, trains and then employs these amazing artisans to craft the cheerful displays, providing the women with an opportunity to learn a trade and to help support themselves and their families. The organization currently employs six women, with hopes of growing their operation to 30 female employees and several more cities over the next year. In addition to having an inspiring social mission, Child’s Cup Full has a green one too: the calendars are made from upcycled surplus materials such as vegan leather and felt. Teachers, these would make a wonderful and philanthropic classroom learning tool and play activity as well. Despite the fact that summer is in full swing, playing "school" never goes out of season for some tots. 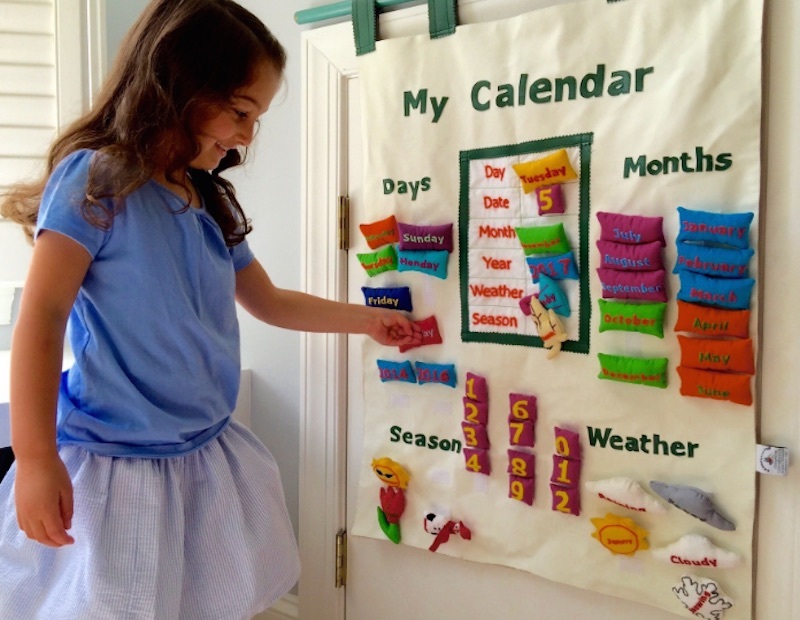 Child's Cup Full's interactive calendar is the perfect enriching activity station�for teacher wannabes: the handmade calendars help kids learn days, months, seasons, and weather. Each calendar is hand embroidered in the West Bank by women from refugee and low-income communities, and takes more than 26 hours to complete. Child's Cup Full, a non-profit, trains and then employs these amazing artisans to craft the cheerful displays, providing the women with an opportunity to learn a trade and to help support themselves and their families. The organization currently employs six women, with hopes of growing their operation to 30 female employees and several more cities over the next year. In addition to having an inspiring social mission, Child's Cup Full has a green one too: the calendars are made from upcycled surplus materials such as vegan leather and felt. Teachers, these would make a wonderful and philanthropic classroom learning tool and play activity as well.